What Disney things do you collect? Generally, I think people, by nature, have the tendency to collect things. Most of my family has a collection or some type or other, it could be pottery, shoes, clothes, art, knick knacks, cough…beanie babies, etc. There is just so much out there to collect and you may be a casual collector, or perhaps a very serious collector who attends conventions or trade shows. For a Disney fan, there are a myriad of things to collect. You can collect vintage Disney items, currently made items, different things like kitchen items, textiles, bags, clothing, books, music, movies, posters, postcards, key chains, ornaments, jewelry. Plus don’t forget all the Disney Pins, Vinylmations, Jim Shore collectibles, Art and Prints. It’s probably not a surprise that I have a love of all things Disney, considering that my earliest collection came from my parents and grandmother, who had provided me with a large collection of Disney books. Unfortunately, my mother gave them and ALL of my books to a family member, which I’m still rather sad about. My dad used to get me Disney magazines, many of which I have still, somehow my mom didn’t give those away. We also collected plush toys from the theme parks. The rule was: one toy, at the end of the day. So, I have many plush toys. I was neurotic about leaving the tags on when I was a child, so at least they are in pristine shape. In my teens, I collected Disney movies, Disney plush animals, and Disney key chains. Back then, it was all VHS tapes, I remember going into K-mart and putting them on layaway. I used to buy Disney plush toys at Disney or at the mall. I still have most of these items, I’d like to have a nice display set up, but I don’t have anything right now. I loved how they had bookshelf displays set up One Man’s Dream at Hollywood Studios, that would be my ideal set up. I have a pin collection, which I started in the late 1990’s, but really didn’t take off until about 2011-2013. I switched to collecting Vinylmations mostly in about 2012-2015. 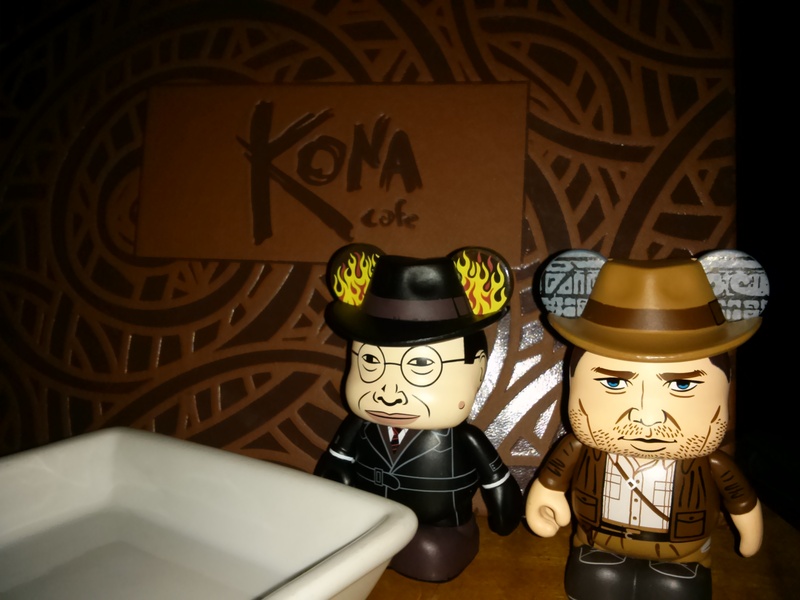 When the stopped Vinylmation trading earlier this year, I lost my interest in adding more pieces to my collection. The biggest draw for me was the ability to trade. I love Disney ornaments and have been collecting those for long time. I also have a love of Disney books, like cookbooks (I collect all kinds of cookbooks), record/story books, children’s books, theme park souvenir books, and more. I collect the odd bit of Disney glassware and kitchen décor, home décor, Disney music, bits of artwork like lithographs, Haunted Mansion themed items, Star Wars items, Muppets items, Nightmare Before Christmas items, and Disney clothes. I have a vintage Walt Disney World candy dish which I treasure, funny since I found it at Goodwill. I really should get a nice bookshelf display set up so I can actually enjoy what I have collected so far. I did manage to find some pretty decent display cases from Amazon for my Vinylmations, I bought Shot Glass Displays for about $30 each, and they can accommodate 3″ Vinylmations quite well in a somewhat attractive wall-mountable black shadowbox case. Do you have a passion for collecting Disney items? What do you collect? No more Vinylmation Trading at Walt Disney World?! As of February 3rd, there is no more Vinylmation trading at Walt Disney world! The news came quite suddenly, we only found out by accident. While trading at Animal Kingdom the cast member said “getting in some last minute trading” and I said “yeah, the park is closing soon” and she then started to explain that the whole trading program was ending, all across Disney property, even at D-Street in Downtown Disney. Unbelievable. We asked why but she didn’t know. We decided to go to D-Street that night and get another trade before we left Disney. The girl at D-Street had some more information, she had explained that they are ending the program because of customer complaints. 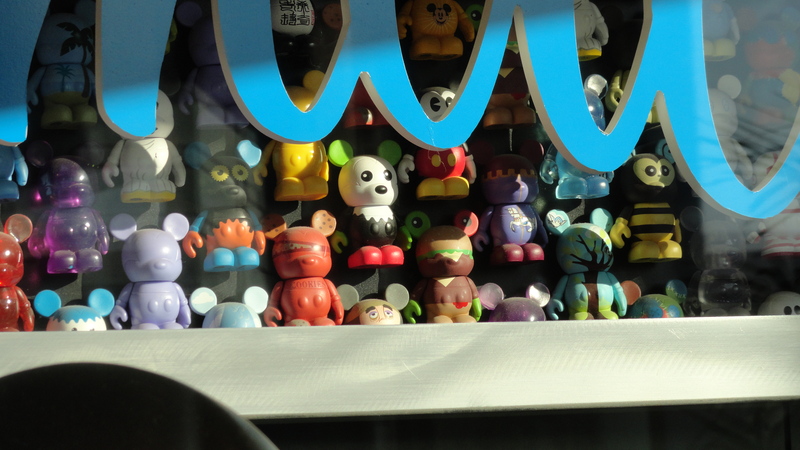 She said that Disney received many complaints about the condition of the Vinylmations and the rules regarding trading. Some complaints are that people are trading figures that are missing pieces and that are in bad condition, or vice versa, that they are not being allowed to trade their poor condition pieces. Other complaints are about the rules of trading, D-Street enforces the rules more strictly than any of the other trading places. I’m really upset about the situation, I love trading Vinylmations. The girl said there were online trading places, but it takes the fun out of it for me. I also don’t want to take chances or pay shipping fees. I find the Vinylmation figures so much more appealing than the pin collecting and trading. I suppose the only way to get them to bring it back is to write a complaint to Guest Relations, and if enough people want it to be brought back, perhaps they will do so. If you feel the same way I do, I encourage you to contact Disney and tell them you want Vinylmation Trading back.